ANOTHER BLOG SERIES BY LAWRENCE H. SCHIFFMAN: Iraq and the Jewish People (11 posts). Editors: De Troyer K., Law T. M. , Liljeström M.
The book contains a preface by the Three (editors) and has five sections—all befitting the recipient of this Festschrift with her interest in Septuagint and Textual Criticism. The first part of the book, entitled The Septuagint. Origins and Translations contains articles on what a translator is and does (such as the contribution from Benjamin G. Wright and Joachim Schaper) or how LXXGenesis functions as the first translation of Scripture (Emanuel Tov) and contains numerous articles on idioms and accuracy (John A.L. Lee), on lexical variation (Arie van der Kooij) and on renderings of nouns (Bénédicte Lemmelijn), verbs (Anssi Voitila), tenses (Raimund Wirth), semi-prepositions (Raija Sollamo), particles (Michael N. van der Meer) or lexical expressions and themes such as the “end of times” (Staffan Olofsson) or ‘labouring women (Takamitsu Muraoka), etc. In the second part, entitled The Septuagint and the Versions. Textual Criticism and Text History, the books that are focused on are Samuel and Kings (with contributions by Jan Joosten, Philippe Hugo, Zipora Talshir, Siegfried Kreuzer, Andrés Piquer Otero, Pablo Torijano Morales, Juha Pakkala, Christian Seppanen) and Joshua (with contributions by Seppo Sipilä and Julio Trebolle Barrera). Then, there are also studies on textual issues and text history of Isaiah (Anna Kharanauli), Ezechiel (Johan Lust), Job (Claude Cox), Ecclesiastes (Peter J. Gentry) and Minor Prophets (Hans Ausloos). The third part of this volume is entitled The Septuagint in New Testament and Christian Use and contains two contributions on textual links between LXX and the New Testament (contributions by Tuukka Kauhanen and Georg A. Walser) and patristic texts (contributions by Reinhart Ceulemans and Katrin Hauspie,). A fourth part of the volume is devoted to The Septuagint in Jewish Tradition (with contributions on how the Tabernacle Account was received in Hellenistic Judaism by Alison Salvesen and ‘Seeking “the Septuagint” in a Scroll Dependent World by Robert A. Kraft). The final part of the volume is dedicated to The Hebrew Bible and the Dead Sea Scrolls. It opens with an attempt by Martti Nissinen to answer the question: ‘Since when do Prophets Write?’ Then, there is the contribution by George J. Brooke who offers a variant on the issue of variant editions, albeit from the perspective of the scrolls. Eugene Ulrich explores the fine balance between intentional variants and isolated insertions in 4QSama and the MT. Sarianna Metso offers an article on the Leviticus traditions at Qumran and Jutta Jokiranta offers a reflection on ‘the stranger’ in the Hebrew Bible and the Dead Sea. The contribution by Hanne von Weissenberg forms a nice inclusion with the opening contribution by Benjamin G. Wright as it too focuses on Authority. Congratulations to Professor Aejmelaeus. And on Facebook, T. Michael Law adds, "Notice this volume's number in its series." He says that the volume should be out by the end of this week. MARK GOODACRE: Jesus' Wife Fragment Latest: Leo Depuydt responds to Karen King . Mark posts the response as a pdf file. I'm not a Coptologist, so I won't try to address the substantive issue. But I do have two observations. First, King's response addresses many of Depuydt's objections, whereas his reply only addresses one of her points. What about the others? Second, the tone of the two responses is very different. King writes objectively and respectfully. She accuses Depuydt of making a grammatical error. If she is wrong, she made a mistake, but she isn't rude about it. Depuydt's reply is very sarcastic and it tries too hard to sound hip and edgy, complete with emoticons. Now regular readers know that I am by no means above a little sarcasm if I think it's justified, but it isn't justified here. King is trying to advance the discussion. If she accused Depuydt incorrectly of making a mistake, this could be pointed out politely and respectfully. I am still quite skeptical that the Gospel of Jesus' Wife is an ancient artifact, but King has made a real effort to keep the tone high and the skeptics should do the same. The record of the Syrian Government with regard to Maaloula has been at best mixed (e.g., here and here). But now is their chance to demonstrate their support of religious tolerance. Let them rebuild the city and restore it to its ancient inhabitants. And re-open that Aramaic Institute. Much more on Maaloula (Ma'aloula, Malula) here and links. THE LOD MOSAIC IS COMING TO THE U.K.: Predators and Prey: A Roman Mosaic from Lod, Israel (PastHorizons). The article has lots of cool detail photos. From there the Lod Mosaic will go on display in St. Petersburg, then back to Israel to be housed in its new permanent museum home, the Shelby White and Leon Levy Lod Mosaic Archaeological Center. More on the Lod Mosaic and other, related ancient mosaics here with many links. LEBANON DAILY STAR: Syrian regime troops sweep through Maaloula. MAALOULA, Syria: Syrian troops triumphantly swept through some of the last remaining opposition strongholds north of Damascus, including the ancient Christian village of Maaloula, sending rebel fighters fleeing to nearby hills amid an ever-tightening noose. The near total collapse of rebels along a key supply route that has long funneled weapons to opposition-held districts around Damascus helps strengthen President Bashar Assad’s hand in and around the capital. The dramatic capture of Maaloula, Sarkha and Jibbeh was the fastest series of army successes against rebels in the Qalamoun region since the government launched an offensive in November in the strategic area, a wedge of mountainous territory between the capital and the Lebanese border. This is certainly news, but it remains to see whether it is good news or bad news for Maaloula (Ma'aloula, Malula). Background here with many links. Cross file under "Aramaic Watch." LIV INGEBORG LIED: GJW and the status of online academic discussion: will you cite this? This post will neither discuss aspects of the textual contents of GJW nor the possible status of the fragment or its text as a forgery - I am not a Coptologist. Rather, this post concerns the function, use and status of online academic discussions: the discussions that take place in blogs, in their commentary fields, and sometimes even on Facebook, and which sometimes may turn out to make a difference to wider academic debates. Background on the Gospel of Jesus' Wife is here and links. EXPLANATION: "Noah" Screenwriter Ari Handel Addresses the Reason For An All White Cast: To Represent "Stand-ins for All People" (Diane Cho, Complex). I raised this issue in passing in my review of the movie, but I didn't really think through the implications until later. The problem, of course, is that by making everyone white before the Flood, the film opens the door to the old racist meme that dark skin color is the curse of Ham. Now to be absolutely clear, the movie does not include the curse of Ham (although Ham does go into self-imposed exile) and I am not for a moment suggesting that the writers intended any such implication. Still, I do not find their explanation satisfactory. Myths do matter, and the problem could easily have been solved with a little diversification of the cast. COSMIC SYNCHRONICITY WATCH: Watch the lunar eclipse ‘blood moon’ tonight, and witness the beginning of the end of the world (maybe) (Sebastian Anthony, Extreme Tech). If you’re into skygazing, you really should stay up late tonight (April 14, April 15) and watch the first of a series of four “blood” moons — a sequence of lunar eclipses called a tetrad that will occur over the next two years, and which some religious types believe signifies the beginning of the apocalypse. Mars is also incredibly close to Earth at the moment, making it one of the brightest objects in the sky. This alignment between the Sun, Earth, Mars, and the Moon has only occurred a handful of times in the last two thousand years, each time coinciding with a “hugely significant” religious event. For non-religious types, though, it’s just a great opportunity to see an amazing astronomical event that probably won’t happen again in your lifetime. Let's hope those omens don't work out this time. Another synchronicity is the eclipse of the moon during Passover. Granted, the synchronicity is mostly in my own head, in that the connection made me think of the famous citation of an ancient historian called Thallus by the fourth-century writer Sextus Julius Africanus as quoted by the ninth-century chronographer George Syncellus. Syncellus quotes Africanus, with reference to the darkness over the land at the time of the crucifixion of Jesus as reported in the Gospels, as follows: "Thallus calls this darkness an eclipse of the Sun in the third book of his Histories." Africanus adds that he thinks this is wrong and explains that a solar eclipse is impossible during Passover because the moon is full and on the opposite side of the earth from the sun. But, of course, eclipses of the moon are okay, and here we just had one last night to remind us of that! Quite a bit has been made of this reference to Thallus as potentially being the earliest external reference to the crucifixion of Jesus and the attendant darkness, but the relevant work of Africanus is lost apart from quotations and the work of Thallus is also lost, again apart from quotations, so whatever Thallus said (which is not quoted verbatim) is nested in two levels of missing context. It is quite unclear whether he said anything about Jesus or the crucifixion in his comment about an eclipse. In addition, we don't even know exactly when he lived, and the argument that he is a Samaritan Thallus who lived a generation after Jesus and was mentioned by Josephus is dodgy. First, Thallus was not an uncommon name and, second, Josephus doesn't actually mention a Samaritan Thallus. This is a debatable modern emendation of Josephus' text. So, alas, the notion of Thallus as a non-Jewish historian writing in the 50s C.E. who mentions Jesus and his crucifixion pretty much evaporates when one looks closely at the evidence. Follow the link for TOC, excerpt, ordering info, and endorsements. BARBARIC: Retired army general wants Egypt's St. Catherine's Monastery demolished. Ahmed Ragai Attiya says that the historic UNESCO site in South Sinai poses a threat to Egypt's national security, after the monks turned it into 'a place for foreigners' (Sherry El-Gergawi, ahramonline). It is one thing for a crank columnist to call for a lawsuit over the legend of the ten plagues. It is quite another for an (up to now) respected member of the military actually to bring a lawsuit to try to destroy some of Egypt's history. If the story is true (and one hopes it is inaccurate or exaggerated), it is dismaying that the suit is being taken as seriously as it is. It should be laughed out of court. More problems for St. Catherine's Monastery, as well as much background on it, noted here and links. The biggest problems were the grammatical errors in the text and the similarities between GJW and another early Christian Coptic text, the Gospel of Thomas. Francis Watson argued that all of the fragmentary sentences preserved on the papyrus are also found in the Gospel of Thomas. He tentatively suggested that the text is a pastiche compiled by a modern forger with an elementary grasp of Coptic. In the absence of clear evidence, the debate is still where it was over a year ago. On the one hand, tests designed to prove that the text is a forgery failed to establish its inauthenticity. On the other hand, the grammatical errors and similarities to the Gospel of Thomas are still a problem. A modern forger with the right materials could still have made this text. And let none of this be forgotten in the excitement over the test results. It really comes down to two possibilities. The first is that we happened to find a very old unprovenanced text that says exactly what the Zeitgeist of the second decade of the twenty-first century would like to hear about Jesus. This text happened to be written in what looks like a fourth century Coptic script, even though the papyrus it is written on tests (at least on the second try*) some centuries younger than that. Moreover, the text is more or less based on the Gospel of Thomas, which luckily we already had, and the ancient scribe even made the same copying error as an entirely independent modern editor of an internet edition of the Gospel of Thomas. So it's possible that the fragment is a genuine ancient(-ish) artifact, but we sure won the big-time lottery on this one! The second possibility is that a forger did a good job of obtaining ancient blank papyrus and obtaining (or mixing up a reasonable facsimile of) ancient ink and used them to create the artifact. 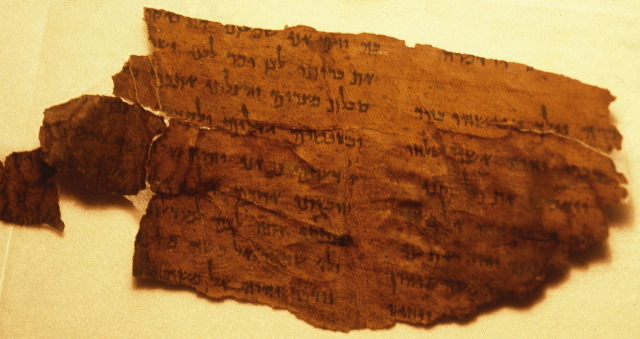 Unfortunately for the forger and fortunately for us, the Coptic script used by the forger was some centuries too early for the papyrus, the forged text is rather too close to its Gospel of Thomas template, and there was a pesky typo in the Gospel of Thomas edition which the hapless forger copied. Those seem to be the options. I blog, you decide. *The first try at a C-14 test gave a date range that was even earlier — before the birth of Jesus. UPDATE: Christian Askeland at ETC highlights an attempt in 1990 to forge a Gospel of Thomas manuscript. Leo Depuydt also debunked it on grounds very similar to the objections to the authenticity of the GJW: Demotic Gospel of Thomas. DANIEL R. STREET: Priests and Israel as Superhuman (καὶ τὰ λοιπά). HAPPY PASSOVER to all those celebrating! The holiday begins this evening at sundown. Biblical passages that describe the precepts for Passover include Exodus 12 and Exodus 23:15 and Leviticus 23:5-8 and Numbers 9:1-14 and Deuteronomy 16:1-8 and Ezekiel 45:21-25. Another recent post on Passover is here. ANOTHER BLOG SERIES BY LAWRENCE H. SCHIFFMAN: Purity as Separation (4 posts).